2. Combine flour, sugar, cocoa, baking soda, baking powder, and salt in a bowl. 3. Add in eggs, coffee, milk, oil, vinegar, and mint extract to the flour mixture. 4. Mix well until smooth (should be a little runny). 5. Pour into cake pop maker. 6. Bake for 1 to 2 minutes or until toothpick comes out dry. The base for this wedding cake is wheat grass. A few white daisies, baby's breath, and some interesting branches carry on the natural theme for the cake. The cake tiers include chocolate mint, French sponge cake, and carrot cake. This wedding cake was Anh's gift to the new couple. The groom was Anh's best friend's brother. Anh made these cupcake bouquets for a PTSA fund raiser. 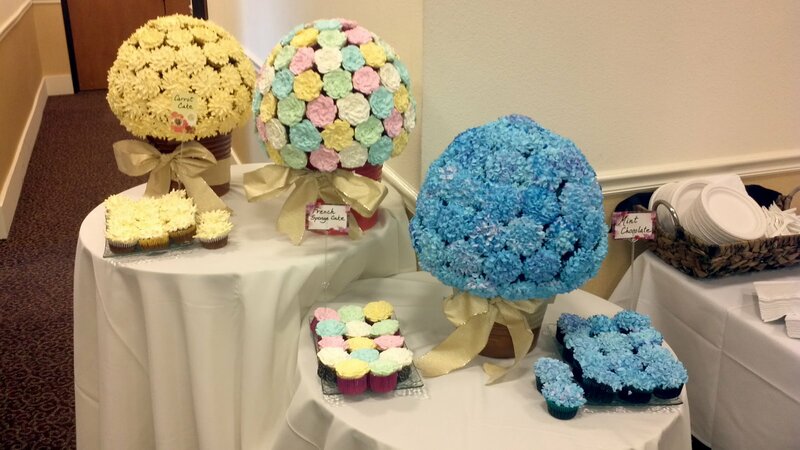 The yellow crysanthemum bouquet is made of carrot cake, the multi-color rose bouquet is made of French spongecake, and the blue hydrangea bouquet is made of chocolate mint. These were quite heavy. Each of the bouquet had more than seventy cupcakes. For Athena's First Communion Celebration Anh made a lot of dessert including these blue Hydrangea cupcakes and these colorful cake pops. The kids and I helped decorate the cake pops. For Sophia's birthday party, we had an animal farm setup in the back yard. Her birthday cake had farm animal figurines on top. But the dirt cakes served in little pails were the main attraction. There were made of layers of Oreo cookie crumbs, chocolate cake, chocolate mousse, and one gummy worm as a special treat! What a difference a year makes. 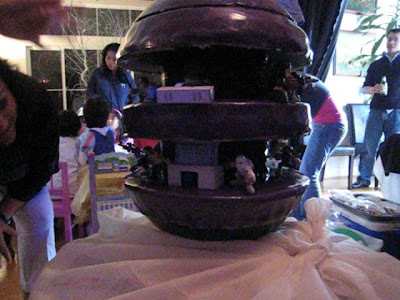 Athena went from wanting Tinkerbell cakes to Star Wars cakes, so Anh made her a Death Star Cake. The molded cakes are separated with plastic cylinders to provide space for the Star Wars figurines. Fondant covers the cake and they were airbrushed to get the nice sheen. Here's a video of the cake. For Sophia's second birthday, Anh made mini birthday cakes for each of the guests. The larger cake on the top was for the birthday girl. And every child got a candle on their cake and everyone got to blow out their own candle. It was a huge hit! This is a simple white wedding cake with four tiers. The bride and groom provided the fresh flowers that decorate the cake. The cake stand was something we had available and the couple liked it, but we don't really carry a variety of cake stands. They are quite expensive. This was another version of the Tinkerbell cake from the previous year. It was encrusted with more sugar flowers along the sides, pansies, daisies, violets, etc. The birthday party was in a skating rink and we had the cake cutting in the little cafe area. It was very cramped but warm and cozy. The Tinkerbell figurine on top is actually a night light that glows in different colors. We still use it sometimes. This birtday cake didn't quite survive the transport from the house to the water park. But Sophia didn't seem to mind. It's a chocolate cake with whipped cream icing and topped with lots and lots of sliced strawberries. This was a simple birthday cake for our daughter's 5th birthday. It's a yellow spongecake with whipped cream icing. The flowers are home made sugar flowers. The leaves are also whipped cream icing. A small Tinkerbell figurine sits on top. It's very bright and cheerful. This wedding cake looked very much like the wedding cake Anh made the previous year. And that was because the couple for this wedding saw Anh's cake from the previous wedding and liked it. We can't remember what this cake was for, but it was a two-tier cake with basket weave icing. The idea for this cake was a toy box. Two teddy bears, a white bear and a pink bear were leaning against the toy box. Pink and white blocks littered the floor. And a yellow duck with wheels sat on the other corner of the toy box. Multi-colored basket weave decorated this cake. It looked like it took a long time to do, but actually the basket weave pattern went quickly once Anh established the pattern and rythm. This was Anh's third cake using a mold. It was a simple cake to make with simple icing patterns to fill up the surface of the cake. This wasn't really a grapefruit flavored cake, it just looked like a cut grapefruit. Anh made this for one of our friends birthday. This was a birthday cake for one of Anh's friend's daughter. The Hello Kitty figures were store bought, the sugar icing flowers were hand made. There were a variety of flowers: daisies, pansies, and pink and yellow aple blossoms. Using a template, Hello Kitty patterns were also iced on the sides of the cake for additional accent. This was Anh's first real attempt at using fondant for decorating cakes. It's a small square cake decorated to look like a little present. The wrapping paper and ribbon are made of fondant. The white flowers where royal icing that was piped and then smudged onto the fondant to create the flower pattern. This is a simple cake, iced with baby blue whipped cream, decorated with simple white flowers with pink centers. Another basket weave cake, but this time filled with yellow rose buds. OK, how cute is this cake? This is personally my favorite cake that Anh has made. This baby lamb on her bed of flowers was so cute that the folks who ordered it had a difficult time cutting into it when the time came. This cake was ordered for a baptismal celebration. I would have had a hard time cutting it as well. This Bassinet Cake was for a baby shower, of course. Baby is peaking out of the bassinet basket decorated with simple white daisies other small flowers.